This entry was posted in Uncategorized on May 9, 2013 by lenaev. – When asked about his opinion about Child Access Prevention Laws he refused to comment. – He believes that one of the key ways that crime can be reduced in the community is to offer alternatives to youths. – He works to target violent groups in the community and put pressure on them, and make it so that the police’s presence is felt. – He believes that straw purchases are a much larger issues when it comes to hand guns getting into the hands of criminals and he suggested that we talk to the Firearms Tracking Unit, which is part of the ATF. He connected us with someone in the firearms tracking unit, but they did not want to comment on anything. – He said that most of the high profile crimes in Pgh are from homicide and sexual assault, and that on average there are about 3-4 shootings per month in Pgh. – He also believes that it is very rare that children are “accidently” shooting themselves or being shot. He sees gun violence as a product of conflict. This entry was posted in Uncategorized on March 18, 2013 by lenaev. I was browsing Vice the other day, and this interview was on their home page. At first I though oh wow, this is some wild critical design- but then I realized, no this is real life. This is a real life interview with a designer that makes this, to be sold, for real. He is serious about kids needing to have bullet proof clothing, and he is willing to sell it to you. We chose a clip from the movie Donnie Darko where in the movie, one of the characters is able to see all of the possible futures of himself and the people around him. The liquid that moves from out of their chests represents their future and what they are attracted to. The main character ( Donnie) begins to see his own future starting to flow ahead of him and follows it. The viewer finds out that he is being attracted to the gun that is hidden in his parent’s closet. We thought that this was interesting because it looks like the gun could actually be attracting Donnie to itself, and is a really good way of illustrating the agency that a firearm has. We end the video by sharing the statistic and hope that is makes a point about the possibilites that can come into fruition when a gun is in the home. This entry was posted in Uncategorized on February 25, 2013 by lenaev. This is a screen shot of post someone I know made on facebook. 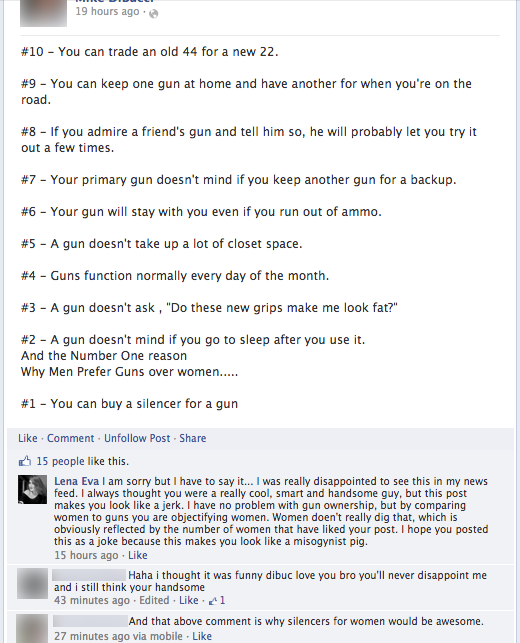 The post that they made is a list of reasons why men prefer guns over women. When Is particularly disturbing to me about this post is how it objectifies women. I was shocked to see that when I saw there no one was posting anything in protest to this post and the post was actually racking up likes from all men. I took the initiative to share my opinion and comment on the post. While I don not know the person that posted it particularly well, I felt the need to say something in opposition to it because people not speaking up is what allows these attitudes to be perpetuated. My individual exploration of the issues in this class will focus on personal responsibility and connectedness in the community of Pittsburgh. Potential impact of Child Access Protection will also be explored. Another issue that will be addressed is urban gun ownership v. suburban gun ownership in our community and the trafficking of weapons. Something that I would like to know is if what I want to do for my individual project is appropriate? Or if it will make a big enough impact? I want to make something meaningful and beautiful to help people gain more understanding about the issues but I am not sure how I can make the most of my work, or I guess that is something I worry about. I don’t want to make something trivial. I guess another thing that I want to know is how to best portray the issue without villainizing or victimizing groups of people. I want to make sure that I am being sensitive to the issue while at the same time having impact. I want to tell a story about how all of us are connected within our community, even if it seems like a stretch. My audience in particular is the suburban and white middle and upper middle class of Pittsburgh and I hope to just raise consciousness around how their purchases and habits around guns can affect the lives of others. Write a poem about there being two Pittsburgh’s that seem to not really be connected, but through the death of a mother in Homewood the reader finds out how we could all be connected to her and her death. Then there is a call to action and reflection about the guns in your home and how they are a part of the problem of violence in Homewood. My reference material will definitely be what I have already read from Private Guns, Public Health. I also plan on talking to Vanessa German. I have been really inspired by her for my individual project because of her work in the community and the poetry that she writes and performs. This summer I had the chance to see her perform one of her poems and I was really moved by the complexity of the material she tackled and by how dramatic her performance was. I plan on talking to her and sharing what I am working on with her so that maybe I can get feedback from her and learn more about her work. I was also really inspired by the interview that I did earlier. I feel like the anecdotal story he shared was really powerful and I want to be able to tell a story that while fictional is able to make people feel that they need to take action. I will also maybe try to bring in some of the stats that Kerry and Vicky shared with us about stolen guns. There is also a Frontline special called “Hot Guns” about how guns are trafficked for violent crime that I think I want to use for research. Also maybe just taking more time to watch the local news for inspiration. The material outcome will be the poem itself along with some other sort of visualization of the poem. I am not sure if I will make the poem into a poster (or series of posters) that use expressive typography to better communicate the poem, or if it will be told like a children’s story with illustrations. There could maybe even be a video montage of scenes of Pittsburgh that could go with a dramatic reading of the poem. The scope of the project is somewhat small. I will be a poem that takes maybe only about 5 minutes or less to read. The components could be posters, a book, or video piece. Maybe if I have time I could do different renditions of it for different contexts. Well, I have already started to write the poem, and I am hoping that I can having it finished by feb 17th so that I can share it with a few people and see how they react to it. Once I finish writing I will have more of idea of what visual form the poem should take. I think that only once I am done with it will I know if it will be best as a poster, or book, or just performance piece to be shared by video, or by whoever wants to read it. Hopefully After Spring break I can share what I have with Vanessa German. By April I want to have the poem fully materialized in a way that it can be shared with all sorts of people. I way I know I am making progress is through my ability to share this with others. Really being able to get my ideas out of my head and materialized in different ways would be the best way for me to know I am making progress. I think that I will measure my success through the reactions I get when I share it. I want to share the poem with different people and see their reactions before I make it something to be communicated more broadly. I have to say though that measuring my success when it comes to something like this is difficult. Maybe if what I make could be used to implore more lawmakers to support child access protection laws, while at the same time educating gun owners why they are necessary would make me feel successful in the project. This entry was posted in Uncategorized on February 11, 2013 by lenaev.